Thank you very much for wanting to make a difference for a dog in need. Please give long and careful thought to whether or not you are in a position to adopt a dog and to commit to its needs for the rest of the dog's life. If you are fortunate, your adopted dog will live 10-15 years, so before you begin the process, think about where you will be 2,4,6 or 10 years from now. All dogs adopted through us are spayed or neutered, current on their vaccines and microchipped. Because the minimum adoption donation rarely covers the costs associated with each dog, we ask our adopters to help us spread the word about the important work that we do. Our adoption donation minimum is $275 for adult medium to large dogs over 30lbs), $250 for small adult dogs, $200 for any seniors 8 years and older and $325 for any size of puppies 1 year and under. Why adoption donation? When we rescue a dog, we will need some funds to cover the pull fee (we pay to the shelter), spay/neuter fee, medical bills (many of our rescue dog come to us in medical condition. A healthy dog still needs $100-300 for a basic vet care and a medical dog needs $500-6000 for their surgery/treatment/medication), vaccinations (all our rescue dogs are sent to our foster care or the adopter's house current on their vaccinations), microchip, transporting ( most of us transport the dog from the shelters or to the vet voluntarily but we sometimes drive over 100 miles for the transport and offer some gas fee to the volunteer who transport a long distance). The donation is tax deductible as allowed by law and helps to offset the costs that we have incurred for the dogs' care and housing during his or her stay with our rescue. The minimum adoption donation does not entirely cover the investments that we have made in the dogs, so if you are in a position to give more, we would be honored to received your additional donations that go directly toward the needs of our dogs. Once we receive your adoption application, we will screen the application and make sure if it is the right dog for you. 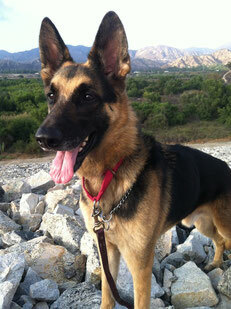 Some breed like German Shepherd or Belgian Malinois may be required the breed experienced dog owner. If your application is approved, there will be a phone inteterview done before you meet our dogs to make sure the dog is a best fit for your household/life style. We contact your referrals, and run a check to make sure you are clear of animal abuse or neglect arrests or charges. We do a homecheck, and if you have a dog/dogs, you will need to bring your dog/dogs to a neutral area for them to meet. We will assist step by step for a successful dog adoption. If you are interested in adopting one of our dogs, please fill out our Adoption Application. If you are surrendering your dog to DOGzHAUS, we will ask $200 per dog as a surrendering fee. We need to provide a blood work, all UTD shots, microchip, spay/neuter surgery and other vet care if needed to the surrendered dog.